Biography of Early Renaissance Painter Famous for Battle of Romano. Detail of Niccolo Mauruzi da Tolentino. One of the most distinctive Old Masters of the Early Italian Renaissance, the Florentine artist Paolo di Dono was nicknamed "Uccello" (bird) because of his paintings of birds and animals. Younger than the traditional 'founders' of the Early Renaissance, like Filippo Brunelleschi (1377-1446), Lorenzo Ghiberti (1378-1455), and Donatello (1386-1466), but older than Masaccio (c.1401-28) and Piero della Francesca (1420-92), Uccello belonged to a generation of artists concerned with the general movement away from the flat decorative forms of International Gothic art, towards naturalism. His work is characterized by an obsession with linear perspective, and a passion for clear colours and tapestry-like compositions. In his painting, Uccello often creates a fairy-tale world of figures, animals and dramatic narrative. Now regarded as one of the best history painters of the Florentine Renaissance, his most famous works include: The Battle of San Romano (c.1456, tempera on panel, divided between the National Gallery London, the Uffizi Florence and the Louvre, Paris); The Flood (1446, fresco, Chiostro Verde, Santa Maria Novella, Florence), St George and the Dragon (c.1456, National Gallery, London), and the Miracle of the Desecrated Host (c.1467, Galleria Nazionale, Urbino). We know that by 1407 Uccello was apprenticed to Lorenzo Ghiberti, in whose workshop he remained until 1415, when he joined the guild of painters, the Arte de' Medici e Speziali. But further details of Uccello's early activity and art training are not clear. From 1425 until 1431 it is believed he was busy creating mosaic art at St Mark's in Venice, and was therefore away from Florence during the period when Masaccio was creating the important Brancacci Chapel frescoes (1425-8; S.Maria del Carmine, Florence). In Venice, the memory of Gentile da Fabriano (c.1370-1427) still lingered, and, thanks to the early works of Pisanello (c.1394-1455) and the enormous activity of Niccolo di Pietro, Zanino di Pietro and Jacobello del Fiore, the International Gothic style was flourishing. Uccello returned to Florence in 1431 with his reputation as yet unestablished, for in 1432 the council responsible for the fabric of the Cathedral made enquiries in Venice about his capabilities as a mosaicist before engaging him. Nonetheless, his rapid absorption of the new ideas in Renaissance art following his return to Florence is demonstrated by his fresco painting of Sir John Hawkwood, completed in 1436 on the wall of Florence Cathedral. The foreshortening and modelling create the trompe-l'oeil illusion that the fresco of this English mercenary leader is a statue - the painting was indeed a substitute for the sculptural effigy originally planned. Unfortunately, the fresco for the Hawkwood Monument failed to please and Uccello was obliged to repaint it. Indeed, it was to be some time before Uccello received the acclaim he was due. For not only had he not been mentioned in Alberti's Treatise on Painting (1436), even though all the great Early Renaissance artists were listed, but, in 1438, Domenico Veneziano (1410-1461), in a letter written from Perugia, did not discuss Ucello at all, although he knew about younger artists such as Fra Angelico (c.1400-55) and Filippo Lippi (c.1406-69). Uccello's painting of Four Prophets of 1443 round the clock face of the cathedral further extends his experiments towards seemingly three-dimensional pictorial space. Then in about 1445 Uccello painted The Flood in the Green Cloister of S. Maria Novella in Florence; here modeling, architectural recession, and light and shadow play important parts. The Flood may be seen as a visual interpretation of the theories expounded by Alberti in his treatise Della Pittura (On Painting) of 1436. Alberti's two basic principles of art - beauty derived from geometry, and decorative form as ornament - are fully realized in this work. Uccello contrasts young, old, clothed, and naked figures, birds, and animals as though to satisfy Alberti's demands in Della Pittura for a copious and varied composition. Both the recession to one vanishing point, and the strange doughnut-shaped collar worn by one of the figures in the foreground are characteristic of Uccello's interest in geometrically constructed space. 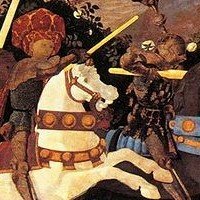 Uccello's greatest work consists of three huge panel paintings, executed in tempera, about 1456, which represented The Battle of San Romano. (The panels are now located in the National Gallery, London; the Uffizi, Florence; and the Louvre, Paris). The work was commissioned by the Bartolini Salimbeni family, but was later seized and mutilated by Lorenzo de Medici, in order to decorate a different-sized space in the bedroom of his summer palace. In many ways an icon of Renaissance art in Florence, the painting is a bloody and action-packed battle scene depicting the historical triumph of the Florentine army over that of Siena in 1432. On another level, it serves to mark the power of the Medici family in Florentine politics. From an artistic viewpoint, The Battle of San Romano is a magical combination of scientific perspective and festive love of incident and action. Broken lances serve both to suggest the melee of battle, and to act as perspective lines to lead the eye inward towards the horizon. In the London panel, a foreshortened, fallen knight and curved armour form part of the perspectival checkerboard of events. Uccelo has neatly dovetailed the new linear perspective with existing rules relating to the visual impression that warm colours (like red) jump forward, and cold colours (like blue or green) recede. St George and the Dragon (c.1455-60, National Gallery, London) uses similar, but less obvious, perspective tricks; the profiled princess still retains an elongated, Gothic quality. The painting is on canvas, rather than the more usual panel, indicating a change in taste: it is a portable possession of beauty, rather than a fixed devotional object. The Hunt in the Forest (1468-70, Ashmolean Museum, Oxford), possibly Uccello's last work, is a veritable carnival in paint showing a hunting party. The movement of the animals is stylized, with their front legs raised and their back legs on the ground. This is a repetition of the formula used for the horses in The Battle of San Romano and St George and the Dragon paintings, and perfectly suggests their springiness. Uccello's lasting contribution to Early Renaissance painting was his ability to overlay basic quattrocento geometric structure with poetic detail. Put another way, he integrates the scientific painterly techniques of the Early Renaissance with the colourful decorative art of the International Gothic style. Despite his artistic achievements, however, Uccello enjoyed little financial security. In his later years, according to Giorgio Vasari, he lived a hermit's life, and in a tax return of 1469, six years before his death, he described himself as "old and unable to work." His reputation as a painter was, up until the mid-20th century, somewhat uneven. However, he is now one of the most popular painters of the quattrocento, respected not only for the power and vigour of his figures and forms, but also for his colour and imagination. His paintings can be seen in some of the best art museums around the world.  For an evaluation of important Renaissance pictures, see: Famous Paintings Analyzed.  For more details about famous Florentine painters, see: Homepage.